This is a Post from the Symbol Surfing Blog from Wed, Nov 28, 2018. 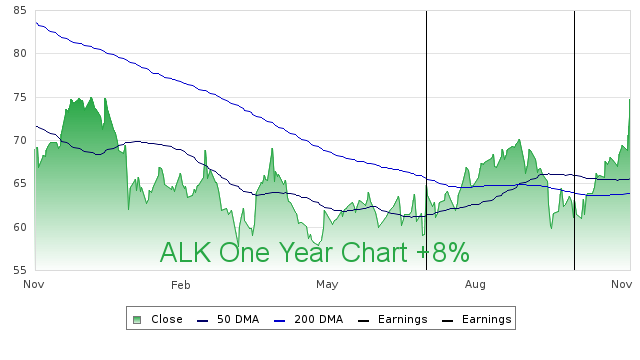 So in my previous post about ALK, I saw what I thought to be a golden cross, which is a bullish chart pattern. The stock price actually dropped, which is just another reminder that stocks don't care about technical analysis, especially during market volatility. As I waited ever so patiently, there was another earnings announcement on Thu, Oct 25, 2018. The stock really started to run. The stock price has moved further and further from the moving averages. This tells me that a pullback could be coming soon. So I am getting out today at around $73. This trade lasted for about 2 and 1/2 months with a return of 18% plus a couple of quarterly dividends.